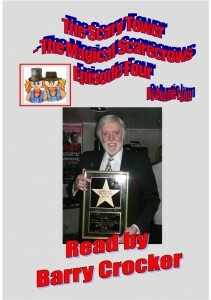 ePubco now has Read-Aloud Books distributed through the Apple iBook Store. The Read-Aloud Book is an ePub with a fixed-page layout that looks like a book and uses a clickable button to start reading the text on any given page. 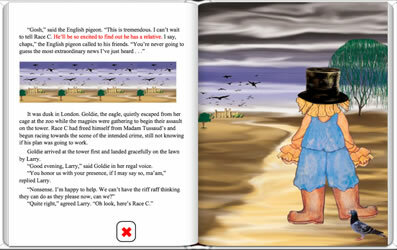 The Read-Aloud Book is designed to work on the Apple iPad and is perfect for Children’s picture books. As it reads the text, the words are highlighted to allow children to follow along, making this the perfect learning tool to aid in word recognition and reading development for young children. Additionally, children’s books formatted in this manner make for great ESOL (English for Speakers of Other Languages) material abroad. As with any iPod/iPad player, you can easily add a pair of headphones for following along while in the doctor’s waiting room, airplane, road trip or other quiet places. 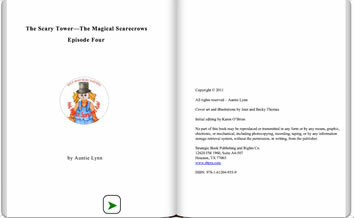 Auntie Lynn’s The Scary Tower is one of our Read-Aloud Books available on iTunes. Take a look at some screen shots from it. This gives a good idea of how your book could function as an ebook. A. Each book has a cover. B. Each page of text has a green arrow to click on to start the reading. C. When clicked, the arrow changes to a red “X” that can be clicked to stop the reading on that page. Notice the highlighted text in red. That is where the reading is at, to allow children to follow along. For more information on how you can get your book converted to a Read-Aloud Book and have it uploaded to Apple’s iBook Store, please us the contact form on this page.